Rennet is an essential ingredient in most cheesemaking. It is widely available online, although most of it is not sustainably sourced. Between GMOs and harmful preservatives, it takes a bit of sleuthing to find the best. 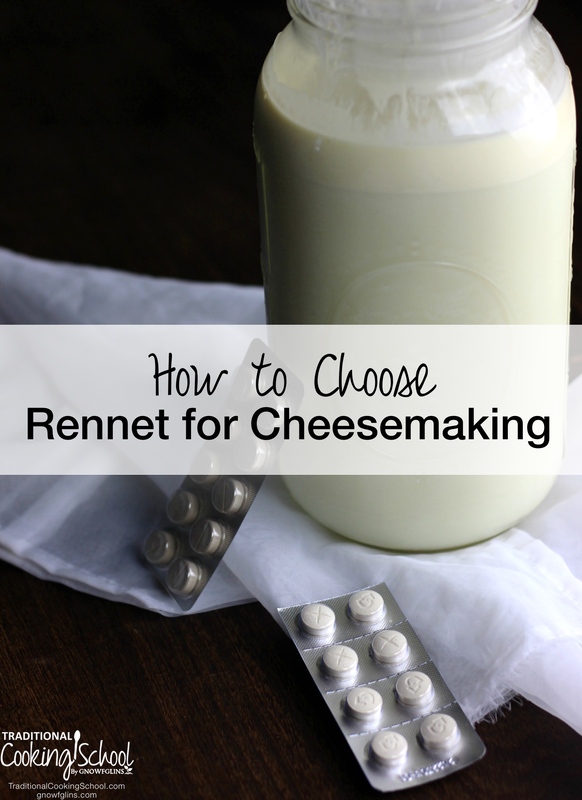 Here are several factors to keep in mind when choosing rennet for your cheesemaking. Most importantly, rennet should be clearly labeled “non-GMO”. GMOs (“genetically modified organisms”) are organisms whose genetic material has been artificially manipulated in a laboratory through genetic engineering, or GE. This relatively new science creates unstable combinations of plant, animal, bacteria, and viral genes that do not occur in nature or through traditional crossbreeding methods (source). Specifically regarding cheesemaking, rennet has been commonly genetically modified since the 1960s. When animal genes are injected into a bacterial host, chymosin (the main enzyme in rennet) results. This fermentation-produced chymosin (FPC) is considered a bacterial product, and is therefore labeled vegetarian. Most rennet labeled this way is, in fact, genetically modified. Some cheesemaking sites sell both GMO and non-GMO rennet — but their descriptions of the GMO product can be misleading. Be warned. I buy my non-GMO vegetable rennet from either Homesteader's Supply or Cultures for Health (see below). As it turns out, vegetable rennet is a misnomer — it is actually microbial, or fungus-based. Keep all this in mind when buying retail cheese as well. 80 to 90% of cheese sold in America is made with FPC and is usually labeled as vegetarian, vegetable rennet, or vegetable enzyme. It may also be labeled as microbial. Cheese labeled as organic, or imported from France or Austria, is most reliably free of genetically modified ingredients. Caution should also be used when purchasing animal rennet — if it isn't labeled as non-GMO, it is likely a byproduct of the inhumane veal industry in America. Animal rennet is recommended for aged cheeses, especially those that will be aged six months or longer. While many find that microbial rennet in aged cheeses yields a bitter flavor, I personally have not yet found this to be true. In addition, animal rennet does set faster than vegetable/microbial rennet. Homesteader's Supply and Cultures for Health both offer non-GMO rennet. Homesteader's Supply offers non-GMO vegetable rennet only. However, Jerri is very helpful and more than happy to special order animal rennet for you if asked. Cultures for Health offers both non-GMO vegetable rennet and animal rennet. Is there any true non-GMO vegetable rennet? A company in Canada is reportedly working on a natural vegetable rennet. Historically, plants like thistle, stinging nettle, and fig sap have all coagulated milk. The latter can, of course, be obtained at home, but currently there is no source offering them for purchase. Even after deciding between vegetable and animal rennet, there is a further choice to be made: tablet or liquid rennet? Many cheesemakers choose liquid rennet as their preferred form because it's easier to measure, especially for small-batch cheeses. Rennet tablets actually boast a longer storage life, however, and they can be used in small recipes with a bit of prior figuring. This means cutting the tablet into eighths or making more rennet than necessary by dissolving a quarter tablet in water, using a portion of the solution, and discarding the rest. It's your choice. Unfortunately, all of the liquid rennet I've found contains a myriad of preservatives to keep it fresh. Sodium benzoate is carcinogenic and poses health risks when combined with ascorbic acid, vitamin C, or citric acid. Potassium sorbate is a polyunsaturated fatty acid salt linked to kidney damage, DNA damage, and allergic reactions. Caramel color is a carcinogen derived from carbohydrates such as corn and wheat and is processed at high temperatures and pressures. Magnesium stearate, often sourced from GMO cottonseed oil, may cause gut damage and malabsorption of nutrients. It is used in tablets and pills because it lubricates the machinery used in factory processing. While experts disagree about the danger of this product, it is highly refined and creates an ongoing demand for a GMO crop, so I avoid it. Sodium chloride is the chemical name of table salt. Acetic acid is the chemical compound in vinegar. Sodium acetate is a form of salt. Microcrystalline cellulose is derived from high quality wood pulp and is used as a bulking agent in supplements and tablets. Mucorpepsin is a naturally occurring proteinase that splits the bonds between amino acids. It creates curds. I make cheese with only rennet tablets because all of the liquid rennets I've found contain at least one of the harmful ingredients above. I successfully make even very small batches. So what ingredients go into the non-GMO microbial rennet I buy? Only two: microbial rennet and salt. Your rennet should have non-GMO and organic labels and come in tablet form. In the end, this rennet and this one get my green light. I'd love to hear about your cheesemaking experiences and rennet choices! Do you already use non-GMO microbial tablet rennet? Can you not make an acceptable cheese using just vinegar or lemon juice? Cheesemaking Supply also has non-gmo rennet although it has magnesium stearate as one of the ingredients. Hello, can you use vegetarian rennet and animal based rennet interchangeably in the above recipe please? Apologies I am referring to the recipe guide for making homemade cheddar cheese.